The latest NVIDIA processor is all about deep learning. If you've been waiting for NVIDIA to finally take the lid off of Volta, the next generation of its GPU technology, your day has finally come. Today at its GPU Technology Conference, the company announced the NVIDIA Tesla V100 data center GPU, the first processor to use its seventh-generation architecture. Like the Tesla P100 the processor it's replacing, the Volta-powered GPU is designed specifically to power artificial intelligence and deep learning so, naturally, it's flush with power. Built on a 12nm process, the V100 boasts 5,120 CUDA Cores, 16GB of HBM2 memory, an updated NVLink 2.0 interface and is capable of a staggering 15 teraflops of computational power. It's also the GPU that drives the company's updated DGX-1 supercomputer, too. 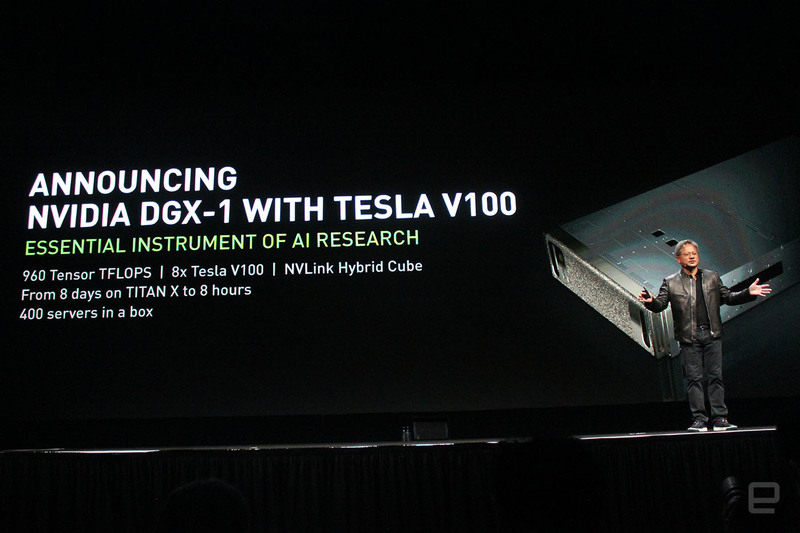 The new Volta-powered deep-learning machine is a lot like it's predecessor -- staggeringly powerful, surprisingly compact and built specifically to train artificial intelligence -- it's just that the new DGX-1V is a lot more powerful. NVIDIA CEO and Founder Jensen Huang says the DGX-1V is powerful enough to replace 400 servers, and has enough oomph to do a week's work of computations in a single shift. That's probably because it has eight of the company's new Tesla V100 chips pulsing at its core lending it 960 TFLOPs of power spread over 40,960 CUDA cores. That AI powerhouse is available for $149,000, starting today -- but developers eager to jump into deep learning on a smaller budget are in luck. NVIDIA also announced what it's calling a "personal AI supercomputer" called the DGX Station. Basically, this $69,000 is a small, watercooled tower with four Tesla V100 GPUs -- giving it about half the power of the company's regular DGX-1V. If buying hardware simply isn't an option, NVIDIA offers one more option: the cloud. The company's new GPU Cloud Deep Learning Stack promises to let AI developers offload their neural network machine learning tasks to an online catalog of integrated and optimized deep learning frameworks running on Titan Xp, GTX 1080 Ti or DGX systems in the cloud. That's a lot of supercomputer news to drop in one day, but it's fitting keynote for this year's GTC. The conference is flush with companies showing off the fruits of deep learning AI -- from facial recognition software to farming equipment that automatically sorts crops from weeds while spraying herbicide. "Machine learning is one of the most important revolutions ever," CEO Jensen told attendees. "Now algorithms write algorithms. Software writes software. Computers are learning by themselves. It's the era of machine learning."